Home Android Unfortunately, How to Fix Google Play Services Has Stopped Error? [Fixed] Unfortunately, How to Fix Google Play Services Has Stopped Error? Are you facing an error which is saying the following line “Unfortunately, Google Play Services has stopped“? And you don’t know how to fix it? But the error is frequently following you all the time whenever you open any Google apps or some other apps, Right? Here I have a solution for you. Reading this complete guide, you can able to solve this error in your Android device with few changes. So, Before getting into the guide, You should know why the error was raised on your device. There can be ultimately two reasons; one is: you haven’t updated the Play Service app to the latest version and the second is: your current Android version is not supporting the Play Service app may be due to some random bugs. But, Don’t worry, I have found some working methods to solve this error. So, Don’t skip any of the methods. 1 How To Fix Google Play Services Has Stopped Error? You can get rid of this error by upgrading the Google Play Service app to the newer version. Select My Apps & Games from the menu. Update Google Play Service to the latest version. You can also try clearing cache of Google Play Service app. Google Play service is the core of all Google apps installed on your Android device. So, Try to clear the cache of Play service by following the steps below. Go to Apps >> Select “Google Play Service” App. Tap on Force Stop and Then, Tap on the Clear cache. This method has worked for many of our friends who have faced this problem earlier. Google Services Framework app is the one which helps to keep updated with Google servers all the time. It also helps in syncing the data from Google servers to phone and vice versa. So, this can also be a problem of getting this error on your device. Then, Tap on Clear Cache. Also, Try to Reboot your device once. Maybe, A simple Reboot could fix this error. The newer version of Google Play app can also conflict the program and cause the error that says “google play services has stopped.” So, The only solution we can do is, Uninstalling the new updates and Reinstalling the Google Play App again. To do so, Follow the steps. Then, Go to Apps >> Select Google Play App and Click on Uninstall updates. Now, Again go to Device Administrator and Enable Android Manager. Now, After few minutes It will show the alert message to install Google Play App. Then, Install it and Restart the phone. If you didn’t get any alert message Simply Download and install the latest version of Google Play from outside. The problem would be with your wrong date and time. So, Changing the date and timings could help you out to fix the error. So, I hope many of you know how to change it. If not, Follow the steps below. Enable Automatic Time Zone which is provided by the network. If methods discussed above have not worked for you then, the last step you can take action to the fix error is, by re-adding the Google account. For that, follow the steps. Again, Add a Google Account and sign in to your device. This method has worked for 60% of our folks. So, You can try this to fix the error. 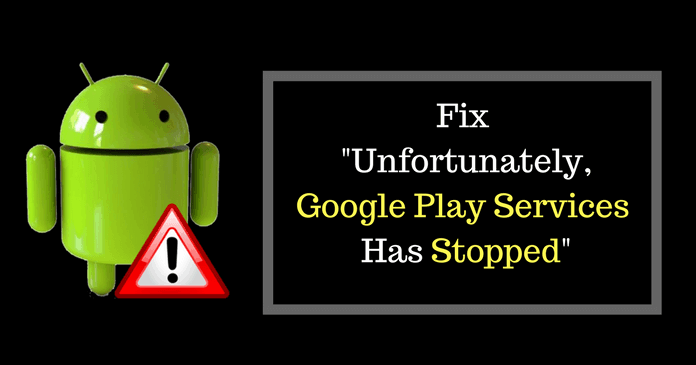 I hope this article helped you solving the error “Unfortunately, Google Play Services has stopped.” If your problem persists after trying all the above working solutions then, Please let me know in the comment section or else, Take a complete backup of your device and Factory reset your device. So, Your device will erase all the data entirely and looks fresh. You can also retrieve your data by clicking on Restore from the backed up account. So, Please do share this with your friends and help them if they are facing the same error. developing google play services has stopped error for your site, you should include casual references to your social media successes.